Location lighting typically requires a bag full of stands and supports, reflective umbrellas, soft boxes and much more. This is before you consider cumbersome battery packs and flash heads that require Arnie-esque arms to lug around. 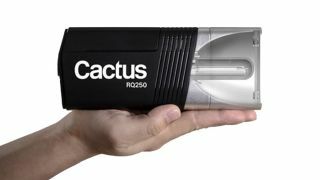 Cactus thinks there's an easier way and its latest RQ250 bare-bulb wireless monolight (due for release this summer) boasts a high output portable flash with consistent light quality for location shooting that fits in the palm of your hand. According to its maker, there simply wasn't a flash tube available to meet the expectations, so the Chinese company designed and built one from scratch. The result is the unique TubeOne flash head design that is said to deliver power with 'maximum efficiency', resulting in a reliable light source that is free from hotspots when used with the detachable, built-in reflector. A clever uni-body design means it can be used with the frosted glass lens to produces a 'beautiful and evenly spread of light', according to Cactus. Or, remove the reflector and it can be used with a bare-bulb flash, which, 'excels in even light distribution when paired with soft boxes and studio umbrellas'. A new Lithium-ion battery delivers 400 full-power 250Ws flashes on a single charge, while the compact unit also features a fan-cooling mechanism, so it can be pushed to limits no matter the conditions. Also, diminutive package comes with an on-axis LED modelling light, which also functions as an AF assist. Comprehensive connectivity sees it supported on Canon, Nikon, Olympus, Panasonic, Pentax, Sigma, and Sony camera systems, while Wireless TTL and HSS are also supported. Plus, a built-in wireless receiver works seamlessly with Cactus V6 II and V6 IIs for Sony. There is currently no official wording on price but it will be available in summer 2018.